1)Before knowing the effect of Mercury in Virgo sign we have to know about Mercury and Virgo Sign. Virgo is 6th house of kalpurush and Mercury is placed here so you may read Mercury in 6th house. Mercury is lord of 6th and 3rd house of kalpurush and placed in 6th house of kalpurush so you may read 3rd house lord in 6th house and 6th house lord in 6th house. When Mercury in Virgo Sign in birth chart native will be liberal (त्यागी), knowledgeable or intelligent, endowed with many good qualities, happy, full with forgiveness, experts in tricks and without any fears. When Mercury in Virgo sign in birthchart native will be a person who loves rightness (Dharma) very much. He will be very good speaker and intelligent and. He will have knowledge of skills or tricks, writing and poetry. He will be very inclined towards science and architecture or fine arts. He will be pleasant speaking guy and like by women. He may be suffering from little sperms count. He will be eldest among family. He will be honorable (पूज्य), friendly, respectable (मानी) and kind. He will be inclined towards serve others and making arguments. He will be endowed with good quality and liberal by nature. He will be full with strength (बलबान). Mercury in Virgo sign in birth chart produces an excellent man who is very good speaker and fond of rightness (dharma). He knows painting, writing, shruti (vedic knowledge) and poetry. He firms in gaining scientific knowledge and crafts. He has little virility with women. He will be a sweet and courteous man who have service, respect and honor of slave. He will be a famous conqueror to be honoured among friends. He will be a man who have unparalleled strength and renowned for his good qualities. 3) Mercury is lord of Virgo sign and also it gets excellent in Virgo and Virgo is also Mooltrikona sign for Mercury. So Mercury in Virgo gives his full effect regarding its natural significant. 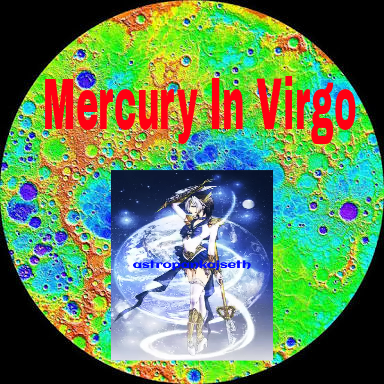 Mercury is karak of speech and communication so Mercury in Virgo indicating native will have experts in speech and communication. He may be pleasant speakers. Mercury is karak of intelligencency so native will be very intelligent. He may be skilled in tricks and calculations. He has good skin. 4)Mercury in Virgo sign indicating native may be very practicle in his thinking because Virgo is earthy sign and mercury is well placed here. 5)Mercury in Virgo (6th house of kalpurush) indicating native will be good physical and mental strength. He will be without fear and he will get victory over his enemy. 6)3rd lord in 6th house of kalpurush means Mercury in Virgo makes native very argumentive and no one can defeat in his argument. He will be a good critizer but in pleasant way. 7)Mercury in Virgo sign indicating native may be good in business and gets good education. 8)Mercury in Virgo sign indicating native may be capable to earn through his own staima. He may gets happiness from his siblings. He will be happiness of servants. He may gets profits from mamaji. 9)Mercury in Virgo sign indicating native may be good player, dancer, comedian or other such type of artists. 10)If you want to know more about Mercury then read this link.